TAKE IELTS WITH US ! Choose your own exam package! A new Cambridge Assessment English test. Cambridge English exams in Poland! Take Cambridge English exam in your city. If you want to work abroad in one of the given professions: Nursing, Medicine, Dentistry, Dietetics, Occupational Therapy, Optometry, Pharmacy, Physiotherapy, Podiatry, Radiography, Speech Pathology and Veterinary Science – take OET exam. 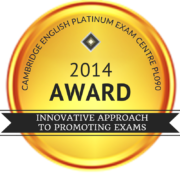 There are only a few Platinum Cambridge Assessment English exam centres in Europe. Lang LTC Platinum Cambridge Assessment English Exam Centre is the only one which has a platinum status among the centres in Poland. By granting this prestigious status to our centre, Cambridge Assessment English appreciated the highest standard of our exam sessions and individual approach to our clients. Since spring 2017 Lang LTC has been a national Cambridge Assessment English exam centre. We run B2 First, C1 Advanced, C2 Proficiency, A2 Key, B1 Preliminary, B2 First for Schools and exams for children sessions in the following cities: Warszawa, Kraków, Poznań, Łódź, Piła, Olsztyn, Trójmiasto, Śląsk (Katowice, Gliwice, Sosnowiec), Radom. Individuals, schools and educational institutions preparing candidates for Cambridge Assessment English examinations are welcome to take the exams at our centre to the exams. Individual candidates can take advantage of our unique registration packages (BASIC, SAFE, COMFY), and the schools registering group candidates can benefit from an attractive bonus programme. Register for the exam. Ask about the offer for schools. If you are preparing for the B2 First or C1 Advanced exam, learn with us on Facebook. You will receive some exam tips (e.g. how to write an essay) and advice (e.g. how to perform during the Speaking part). You will also revise the vocabulary needed for the exam. We invite you to profil FB FCE –exam tips oraz FB CAE – exam tips. If you are planning to take C2 Proficiency (CPE), C1 Advanced (CAE), B2 First (FCE), B1 Preliminary (PET), A2 Key (KET) or Young Learners tests, get to know the exam and see what the Speaking part looks like. Upload a Cambridge English sample test. Check how B2 First (FCE) Speaking part looks like, how to prepare for it and what to do during the exam, when you do not know how to answer the examiner's question.